My wife & i were on vacation in the outer banks, nc riding in an open truck to view the wild horses on the beach, the truck stopped, we were told to buckle up, as the ride on sand might get bumpy. during the stop, i observed what at first, thought was an oddly shaped dark looking cloud, i say odd, because the whole sky, for as long as i could see, was perfectly beautiful, but this long, square, object, had straight lines, on several of it's sides, i immediately told my wife, who took a quick look, but was more interested in seeing horses. as the tour trucks engine starts up again, i looked up at it and saw yet another object, which was different in size and shape, towards the upper middle of the photo, the first one is towards the right upper area, i was thinking, '' what is going on,'' ? i decided to take a photo and wanted to get both of what i thought was something, other then white clouds and blue sky. 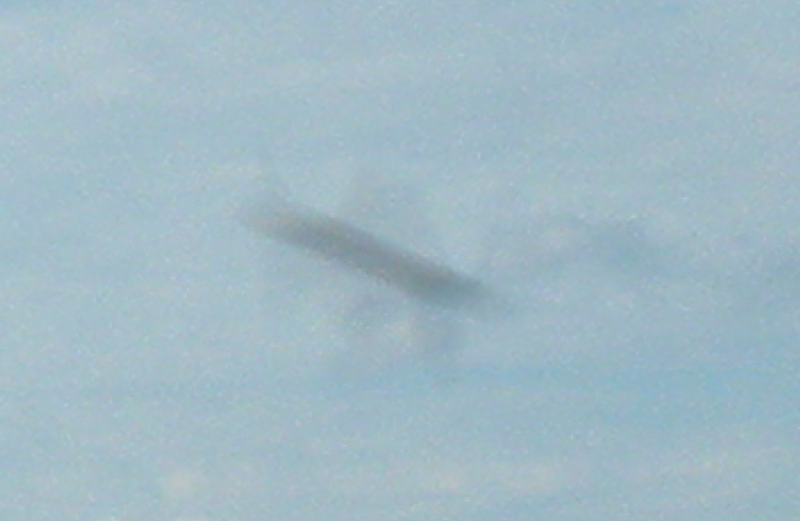 the first long square looking object i'd say, rough estimate, somewhere in the area of 3-4000 ft long, sorry if that sounds crazy, the second other one, i have no idea, i am assuming it's quite large as, given the fact that i can plainly see it up in the sky. 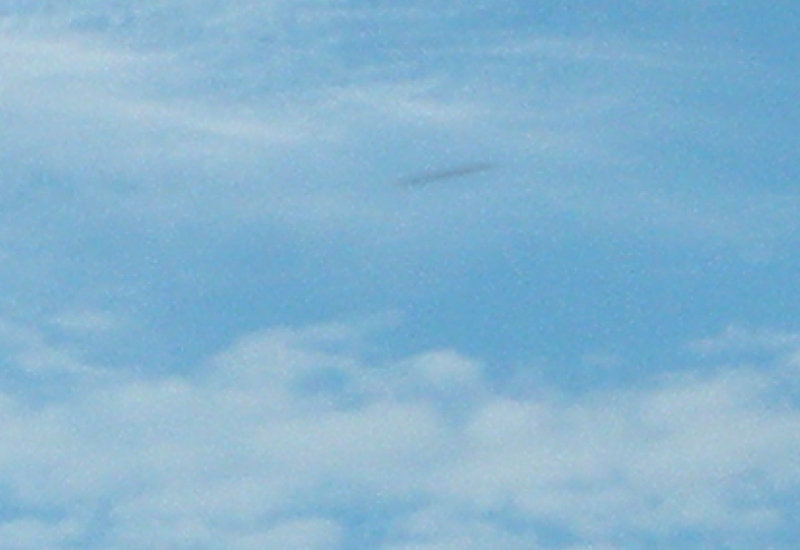 the first object, was moving upwards but straight into the clouds, i can't explain it's movements, i used a nikon coolpix 12 mb camera to take the shot as my other 16 mb sony was better suited for closeup shots. in my line of work, i am trained to spot inconsistencies, and these two objects, as we say, ''jdlr,'' just don't look right. another interesting thing about the first object, it kind of looked as though it blended or attempted to blend in with the surrounding clouds but, it was not only considerable darker, but also had straight lines and there were no trailings coming from the rear, i cannot fathom, it's size, for the briefest of moments, as it was entering the clouds, i thought i saw what looked like something roundish on the bottom, the photo i took, shows something. i am including 4 photos, the original one, on back of the truck and the other 3 are of what i tried to enlarge, just to give you a better idea, of what i saw. 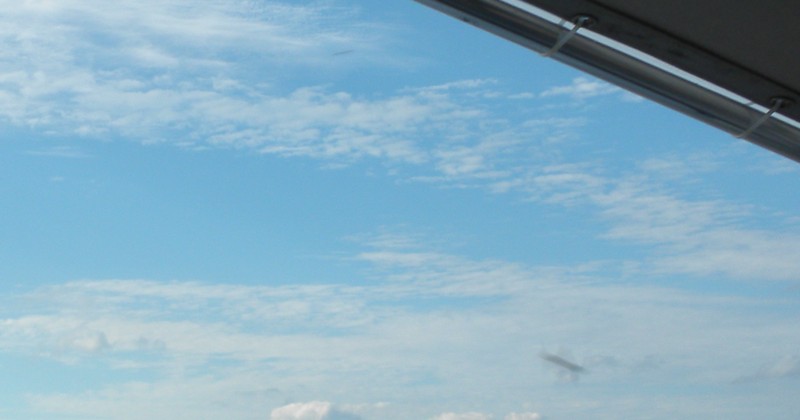 i am not claiming ufo's, at closer inspection, it was something. i lost sight of both objects, when the truck began moving down the beach, though, i kept trying to see, under the awning, for as long as i could.